4. Getting approval to start the next stage. 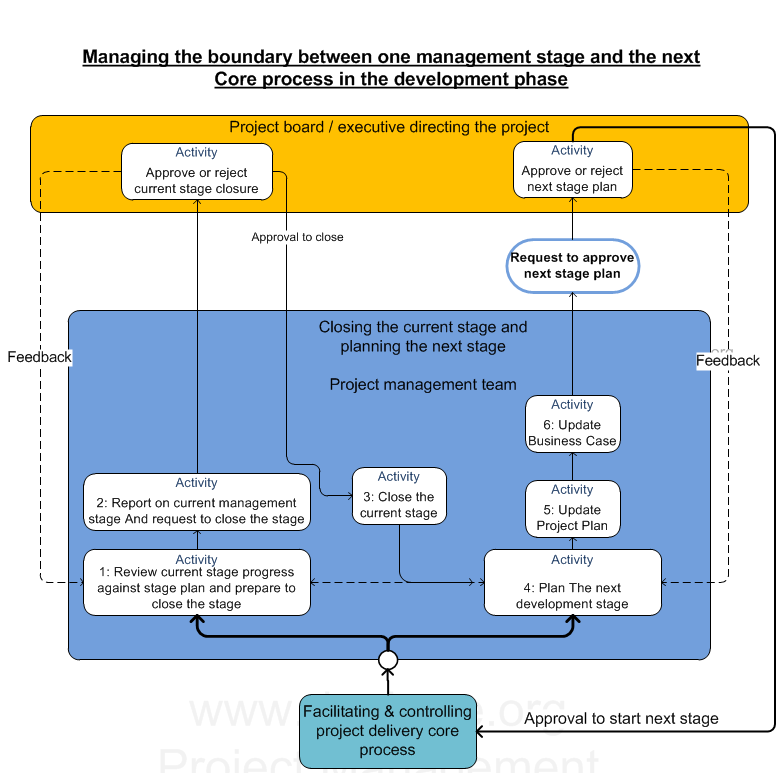 Before the project executive can approve the closure of the current stage or the start of the next stage they need to know what the current status is. 2. Is the project within cost tolerances? 3. Is the project going to be delivered within time tolerances? 4. Is the quality of current deliverables acceptable? 5. Are there any significant risks or issues that may jeopardise the project? If the team has done a good job and delivery is within the agreed project tolerances, then getting approval to close the stage should be relatively straight forward. While the project manager is responsible for preparing the relevant information with the project team, the project executive is accountable for approving the closure of the current stage. The business analyst, product owner, technical lead and project manager will all be involved in this activity. Based on the project plan road map and lessons learned the team can plan the work they are likely to be able to deliver in the next management stage. It is within this activity that the team will do further discovery and design work to compliment the work done in the initial discovery and design phase during the planning and initiation core process. Once the requirements for the management stage deliverables have been defined, they can then be divided up into sprints. The project team under the leadership of the project manager will have prepared a plan for the next management stage and updated the project plan and business case. This now need to be presented to the project executive/board for approval. The next stage should not move forward until the executive has given approval to do so as there may well be extenuating circumstances that will cause the executive to pause or close the project. The project executive is accountable for the decision to continue with the project. It is important that the project executive informs the project manager what information is needed upon which the decision will be made. What are the important outputs fro this process? Important outputs from this process will include the closing report for the current management stage and the management plan for the next management stage. Both of these will be presented to the Project Board for approval. Approval of the closing report means that this management stage is done, approved and closed. Approval of the plan for the next management stage means that the project board has given the go-ahead and for that work to be done and the project team can start on this work. Some people may say this is too bureaucratic, I believe that this work adds value in that it ensures everyone has a common reference point to work from and we confirm that everyone is working to the same plan.